MoreAt the law office of William B. Cummings, PC, in Alexandria, Virginia, we offer the aggressive advocacy and effective defense strategies our clients deserve who face any type of criminal charge. In addition, our law firm also represents innocent accident victims and their families adversely affected by another party's negligence or wrongdoing.Serving Fairfax, Prince William, Arlington and Loudoun counties as well as all of Northern Virginia, the attorneys at our law firm have over 80 years of...At the law office of William B. Cummings, PC, in Alexandria, Virginia, we offer the aggressive advocacy and effective defense strategies our clients deserve who face any type of criminal charge. In addition, our law firm also represents innocent accident victims and their families adversely affected by another party's negligence or wrongdoing. Serving Fairfax, Prince William, Arlington and Loudoun counties as well as all of Northern Virginia, the attorneys at our law firm have over 80 years of combined experience in the areas of criminal law and personal injury law, as well as civil litigation. This means you can expect to receive the highest level of advocacy and support for your serious legal matter, regardless of how complex or challenging your situation. When you work with our law firm, you will receive quality advice and compassionate counsel directly from an attorney totally devoted to protecting your rights and interests and helping you achieve the positive results you seek. Being a small practice, we can offer this personalized level of representation at rates to fit any budget, and our practice receives many positive reviews and referrals from satisfied clients. 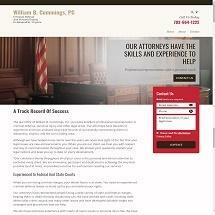 Our founder, attorney William B. Cummings, is a former U.S. prosecutor and top-rated defense and trial attorney who holds an AV Preeminent* peer review rating from Martindale-Hubbell. Our associate, David Thomas Williams, has extensive experience in several practice areas and holds a Martindale-Hubbell Distinguished* rating. With such impressive credentials, you can rest assured your case will be in the best hands possible. To discuss your needs and receive the highest level of representation and advocacy for your legal challenge, you can contact William B. Cummings, PC, to schedule a consultation.